From a very early age, Tajae Tyrell found herself fascinated by crime programmes such as Murder She Wrote and Columbo. "I've just always had an interest in crime," she explains. "As I got older, that stayed with me, but I found myself increasingly interested in the causes of crime, as well as the policies and procedures in the criminal justice field that are used to combat crime." Little surprise then, that Tajae found herself applying for a place on LSBU's BSC (Hons) Criminology course. "The subject matter speaks for itself," she smiles, "but LSBU was the ideal place for me as it means I can be near my son – and I love the diverse culture of the student body here." 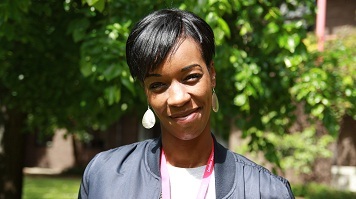 Since starting at LSBU, Tajae has found the supportive nature of our academic team to be invaluable in helping her pursue her dream of becoming a Criminology lecturer or setting up a social enterprise working with care leavers who have been in the criminal justice system. "As a care leaver myself, I've often felt that asking for help is a sign of weakness but being at LSBU has really changed that," says Tajae, and she is quick to single out her supervisor, Cait Beaumont, as an inspirational figure that has frequently gone above and beyond the call of duty. "She has always been very supportive, " says Tajae. "She motivates me to apply for roles when I feel I don't even stand a chance, and it is staff like her that really help LSBU to stand out from the crowd." The staff here all want their students to succeed, and it shows in everything they do – the open door policy, the regular contact time we have together, and the level of support I have been given every step of the way – even when I have found things tough, they have been there for me to help me through it. The support that Tajae has received have helped her to develop her skills and her confidence to take on more challenges, none more than volunteering for SOVA, who work with ex-offenders who have mental health problems. "I also work as a student ambassador at recruitment events," she says. "I feel that in my work and through my success at LSBU, I want to show young people that no matter what problems they have had in life, they can achieve their goals if they work hard."